SUMMARY: Jennifer Johnson McCarthy has a stubborn streak a mile wide, and it puts into motion a series of events that will change her life forever. A spat with her husband on the beach in Destin, Florida. A near drowning. And a chance encounter with Hank—a mysterious old man with a story to tell. What is it about Hank’s stories and the town he calls home that fascinate her so? And why is it that her husband and grandmother are determined she should not hear the old man’s tales? With her marriage falling apart and everyone second-guessing her every move, Jennifer has a choice to make. Return to her overbearing husband and resume a life of privilege or start anew. The future awaits. But so does the past. 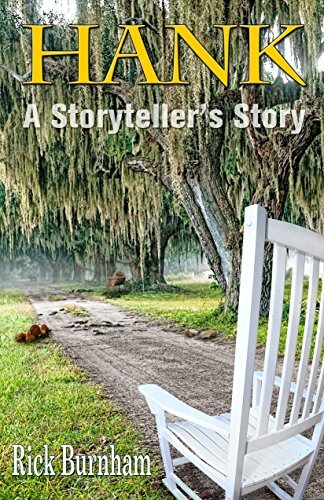 THE BACK STORY: Hank’s stories are colorful and entertaining, and they stand in stark contrast to his own – a tale of great tragedy and tremendous loss. WHY THIS TITLE? : It is that personal story that is the backbone of this book. WHY SOMEONE WOULD WANT TO READ IT: Anyone who is a fan of chance encounters, who is familiar with emotional bonds of friendship and family, who knows of the eternal longing of a broken heart, will love this book. AUTHOR PROFILE: Rick Burnham is a 22-year veteran of the U.S. Air Force originally from the Florida panhandle. He has three books to his credit, and begins each day with a cup of coffee and a thousand words. He dabbles in woodworking, and lives in Cairo, Ga. with his wife Stephanie. The BMW wove in and out of traffic driving east on I-10 at a hectic rate of speed. Emerson gripped the wheel tightly as he drove, changing lanes consistently, and his comments aimed at other drivers ran the gamut from mere frustration to stinging insults. He narrowly missed clipping the back of a large, black SUV only to curse loudly after getting stuck behind two tractor trailer rigs ten minutes later. She cautioned him to remain calm and at one point volunteered to drive. The Florida State Trooper who stopped them in Madison County said the car had been clocked at ninety-two mph. Objection, your honor. The counselor is stretching the truth just a bit. The sardonic expression on Jennifer’s face might have said as much, but she calmly handed the newspaper clipping from the Bay County Journal over to her husband, who handed it to the trooper, along with his license and registration. “We very nearly lost her,” he said, his voice wavering ever-so-slightly. “As a matter of fact, when we pulled her from the surf, I thought she was gone. Her lips were already turning blue and.…” He stopped talking and peered ahead through the windshield. Did he just whimper? Oh, you are good, counselor. Very good. The trooper held the clipping up in the early morning sun and began to read. A local lifeguard is being credited with saving the life of a Jacksonville woman Thursday at Destin Beach. Witnesses say Drew Roth pulled the lifeless body of 26-year-old Jennifer Johnson McCarthy from the water shortly after 2 p.m. and immediately performed CPR. By the time paramedics arrived on the scene, McCarthy had begun breathing on her own and was sitting upright. She was transported to Bay Area Medical Center in Panama City where she remained overnight for observation. Roth said he had noticed the woman entering the water and watched her swim away from the beach. When she began to struggle with the undertow—which was blamed for three deaths in local waters a year ago—he responded. A man who identified himself as McCarthy’s husband declined comment on the incident, but others were quick to praise Roth for his actions. Roth, 22, graduated from Fort Walton Beach High School in 2006. The officer handed the newspaper clipping back to Emerson and peered across the seat at Jennifer. “That must have been a terrible experience,” he said warmly. “You have to watch the undertow over there. Been in it myself, and it is no joke.” In a more serious tone, he asked Emerson for proof of insurance. He took the paperwork and walked back to the patrol car. Emerson sunk down slightly in his seat, shaking his head from side to side, sighing deeply. Jennifer turned away from him, staring silently out into the dense foliage along the interstate. “I am very tired, and I also have a headache, and now I am a witness for the defense?” She could feel his steely glare on the back of her head. “No, but now he is going to give me a ticket, and it is just one more thing on top of everything else,” he said. She wanted to remind him that he was breaking the law by driving erratically on the interstate, and he fully deserved to be ticketed, but she backed away, not wanting to begin an argument that would further complicate the issue. Emerson’s stern expression masked a hint of a smile. It was a look that Jennifer had seen often in their three years together, usually when he managed to get the better of someone. He had talked the BMW dealership down several thousand dollars before buying the car they were in now and had done the same with the Chevrolet dealer with her Malibu. He had also managed, in perhaps his best performance, to ease his way out of the predicament he was in with her parents after that fateful night of drinking. She wondered now if the expression had manifested itself following his conquest of her. The officer handed Emerson’s paperwork back and peered into the car toward Jennifer. “Hope you feel better Ma’am.” She nodded, thanked him, and, exhausted, turned away again. Moments later, they were back in traffic. Emerson slowed down somewhat but still drove slightly above the speed limit. Jennifer noted as much when she leaned over and glanced at the car’s instrument panel. “Don’t say it,” he warned, and she didn’t. Neither said a word again until he took an exit in River County fifteen minutes later. He pulled up to a small station just off the interstate. The tires on the BMW barked as the car came to a sliding stop alongside the gas pumps, dust churning in their wake. A couple entering the store stopped and glanced back at the pumps with a look of disapproval. Jennifer got out of the car and started toward the small convenience store. “Where are you going?” he said, pulling a credit card from among a dozen others in his wallet. He turned his attention to the gas pump, muttering an obscenity just as she opened the door of the store and walked in. A small crowd of people huddled together in the back of the store turned to see who had entered before turning back again. Something about the group peaked Jennifer’s curiosity. Taking a bottle of water out of a large cooler near the front of the store, she slowly gravitated toward the group in the back. As she got closer, Jennifer noticed the group was directing its collective attention to a small man sitting in front of them on a couple of empty soft drink cases. He was an elderly fellow dressed in clothes that perhaps had once fit well but were a bit too big now. His hair was solid gray, and his face looked affable but at the same time a bit worn. There seemed to be an exuberance in his eyes though, so much so that she could see it from a distance. Jennifer felt enthusiasm rise in the crowd as the old man began to speak…, a subtle energy, as if the curtain on a production had just gone up. The old man looked around the crowd as he spoke, making eye contact with everyone there. He’s a natural storyteller, Jennifer thought. “Anyway, one summer, Walt and Geneva went over yonder to Laketree to see the circus. They were there for a couple of hours and got to see everything just fine, including the tiger act, which was Geneva’s personal favorite among all the circus animals. She always said that if there was to be a fight between a tiger and a lion, the tiger would win because of its stripes, which she said have a way of hypnotizing the tiger’s victim. The comment drew a few chuckles from the small audience. Jennifer offered a slight smile, looking back over her shoulder at Emerson still standing at the pumps. “Well, Walt and Geneva headed back to Oak Springs, and by ten or so that evening, they were in the bed asleep, which was late for them. When you farm tobacco, it makes for an early day, and there were not too many nights when Walt was awake past eight or nine. But Geneva shore did like the circus, especially those tigers, and Walt shore did love Geneva. And she could cook like you wouldn’t believe. A middle-aged woman turned to Jennifer with a look of amusement and then turned her attention back to the old man. “Anyhow, Bob was right in the middle of the ruckus outside and so was that mangy, old mutt that belonged to Wilbert Perkins who lived down the road from Walt and Geneva. Wilbert called himself a farmer just like Walt, but he never was any good at it. Tried to grow some corn, and it was the most pitiful field of corn you ever saw. His wife Jerry had a job out at the sheriff’s office, and that was what kept them going, if you ask me. “Well, both those dogs were going crazy outside, and it wasn’t long before Walt’s hunting dogs were going crazy too. Walt was not much of a hunter, but he still liked to do a little bit of deer hunting from time to time. He was a much better farmer than he was a hunter, but that is neither here nor there. He had a half-dozen or so dogs in a pen out back of the house, and once they got riled up, it sounded like the world was coming to an end. It really did. Laughing, Jennifer looked over her shoulder at the gas pumps. Emerson was still there. She turned back to the old man telling the story, satisfied she still had time to hear more of his tale. “But Wilbert Perkin’s dog just kept barking, so Bob couldn’t stand it and started back up too. Well, Bob had never defied Walt before, because he knew Walt would find a stick, and this told Walt there was something out there making these dogs bark. So he put on some britches and grabbed a flashlight and went outside. Well, there was something out there all right, and when Walt saw what it was, it liked to scared the dickens out of him. It was a monkey. That’s right; it was a monkey, in the back of Walt’s truck, in the dog box he used to haul dogs out to the deer woods. “The best that Walt and Geneva could figure, the monkey had come from that circus they went to that night. It had escaped and climbed in the back of the truck and had come home with them. Well, Walt was an honest man—he’d do anything in the world for you if you needed help—so he immediately decided they would head back over to Laketree and give the monkey back to the circus. But I guess Geneva had a soft spot in her heart—women are like that sometimes—and she put in for them to keep that monkey, reminding Walt of how the circus workers had been carrying guns and clubs and a net. “Well, it was an idea that didn’t sit too well with ole Walt. At least not initially. They already had plenty of mouths to feed as it was. They didn’t have any kids. The doctors had told them years before that Geneva would never have children, but they did have seven dogs, and that was quite a burden. Walt finally agreed that they would keep the monkey overnight, and they would discuss it further in the morning. He figured the light of day would make Geneva see things a little more sensible, and that they would have that thing back in Laketree by noon or so. Laughter ensued from the crowd, but a single voice rose above it all, one that was not at all amused. “Jennifer! We have to go!” It was Emerson, standing at the checkout counter. She glanced over her shoulder at him briefly and turned back to the storyteller, ignoring her husband. “Jennifer!” It was his courtroom voice, commanding attention. Embarrassed at the intrusion, Jennifer glanced apologetically around the room at the people in the crowd and at the old man telling the story. He was glancing toward the front of the store where Emerson currently held center stage. The storyteller’s congenial expression faded away, replaced with a more stern and unforgiving look, but when he made eye contact with Jennifer, the good-natured appearance returned. “Jennifer! Let’s go!” Emerson said, and each of the people in the group listening to the old man turned and stared at him. About half then directed their attention back to Jennifer. She turned away from them and walked to the front of the store where her husband stood. She pulled the five-dollar bill from her pants pocket to pay for the water and placed it on the counter. “If I get back out in that crazy traffic right after taking these pills, I will be carsick,” she said. “If you want to risk it with your Beamer, then fine, but I would prefer to take a break. The clerk glanced over at Emerson, and he returned it with a look of exasperation. He then turned and abruptly walked out of the store. The clerk gave Emerson a look of disdain as he did and turned to offer Jennifer a smile. “I have something, but thanks,” Jennifer said with a smile, turning away from the counter. She walked back to the crowd again and regained her spot. The woman in the crowd, who had smiled at her before, did so again on her return. This time, the storyteller, who had watched the scene at the front of the store with interest, continued his narrative, speaking more in Jennifer’s direction than before. “Well, Geneva went to the kitchen and got a handful of bananas—it was pure luck that they had any, to be honest. But Geneva had gone grocery shopping earlier in the day and had bought some because she knew Walt liked to have them on his cornflakes, sliced up, you know, like some people like to have. So once they had the dogs put away, Walt peeled one of them bananas and put it in the dog box, right there at the edge of it. “Well, apparently the folks at the circus did not feed their animals too well, because that monkey—he was a chimpanzee, not one of them boney little organ grinder monkeys, but a chimpanzee like the one that used to follow Tarzan around—that monkey came over and got that banana and started eating like he hadn’t had nothing to eat for a month of Sundays. When Geneva put in for Walt to give him another one, Walt looked at her like she was crazy. They were supposed to be for his cornflakes, but he did it anyway, and the monkey ate that one too, just as fast. “They took the last banana and used it to lure that monkey up to the front porch where Geneva put a bunch of blankets and a baby bottle full of milk. That bottle belonged to Kristy Williams; Geneva used to watch her youngest while she was working part time. They had some hard times when her husband Bobby hurt his back working out at the mine. But you know Geneva and Walt…, always willing to help people out when they needed it. The crowd offered a group chuckle, and Jennifer joined them, glancing once again over her shoulder at the gas pumps. The BMW was gone. “So, against Walt’s wishes, she bundled that rascal up, brought him inside, and put him on the couch. They decided to keep the monkey, and that surprised those of us who eventually found out about him. I guess it was the fact they never had been able to have any kids that did it, and he weren’t nothing but a baby when they got him. They kept him, and they kept him for quite a while as I remember. “Of course, Bob Barker didn’t care for that monkey one bit. He’d sit there at the window and bark his head off for the longest time, usually until he got so hoarse he couldn’t bark any more. Then he’d just sit there looking inside. Walt has a picture of those two: Bob on the outside, inches from the window looking in, and DJ—they named him DJ, which was short for Don Johnson—Geneva liked to watch Miami Vice. DJ was on the inside, inches from the window, looking out, staring that bulldog down. “Bob would do his best to catch that monkey and nearly got him several times. He’d sneak right up to the corner of the house and sit there and wait for Geneva to bring the monkey out. DJ helped Geneva hang clothes out on the line, but he always kept an eye out for that bulldog. And sure enough, no sooner did they get started hanging clothes and here came Bob Barker, racing across that back yard, thinking he finally had the jump on DJ. But that monkey was just too fast, and he’d always make it to a tree, and that would be it. Geneva had to put the dog in the pen before DJ would come down. Sometimes, Bob proved to be a little more than Geneva could handle. Walt would pull up in the yard after work, Geneva and Bob standing there looking up in the tree. “Walt told me Bob actually had the monkey cornered on the front porch one day, and he figured it would be the end of DJ. He fully expected that bulldog to tear him to shreds, but it didn’t happen. Said Bob lunged after him with his fangs out, ready to clamp down, but ended up getting the worst of it. By the time they separated them, DJ had bloodied that dog’s nose and blackened one of his eyes. I didn’t see it, so I really can’t say for sure if it really happened. But Walt Murphy is an honest man; he’d do anything for you if you were to need his help. He is an honest man, and if he said it happened, well then you can bet that it did. “After that, the two of them apparently got along okay. Walt said they’d sit there together on the couch and watch television, and Geneva would put DJ on the dog’s back, and he’d ride him around the living room during commercials. A man in the crowd started laughing and looked down at his feet, shaking his head from side to side. “Walt used to play cards with a few guys from around Oak Springs. Jimmy Keen, Arnie Lewis, Roy Grace, and Jess Barron. It wasn’t high stakes or anything like that. Just a nickel-dime-quarter type of thing. Geneva wouldn’t have let Walt play if it was anything more than that. They’d get together about once or twice a month to play, and they’d switch locations each time, rotating between each other’s houses just to break up the monotony. Well, of course, Walt was not too keen on them coming to his house to play because, well, he had a monkey in the house that he really didn’t want anyone in Oak Springs to find out about. “Anyway, Roy Grace brought it up one night during a poker game that Walt had become too good to have the boys over to play at his house. The rest agreed and started putting pressure on ole Walt, so he eventually gave in and invited the boys over, but it didn’t work out too well. Oh, Walt and Geneva went to great lengths to keep DJ under wraps while they were playing cards at the house. Walt went out and bought a chimpanzee tape to play on the television within eyesight of the poker table. I believe it was a Mutual of Omaha’s Wild Kingdom tape with that Marlin fella on it. They put that tape on the television so that if DJ decided to make that screaming noise, you know the one I am talking about; the boys would just assume it was coming from the tape. That backfired, of course, because once DJ starting hearing chimpanzee noises coming from the living room, his instincts kicked in, and he came running in and busted up the game. “Well, Walt thought that would be the end of poker games at his house, because he didn’t think the boys would tolerate playing with a monkey in their presence. But it wasn’t a week before Jimmy Keen was asking about having the next game at Walt and Geneva’s house, and they all asked if they could bring their wives over to see the monkey. Jennifer looked again at the gas pumps. No BMW, and no Emerson. When she turned back around, she saw the old man looking directly at her. The corners of his mouth seemed to turn up slightly as he spoke, as if he were about to smile. “Anyway, after a month or two of watching the boys play, DJ started becoming more and more interested in the cards, to the point where he actually figured out the game, or at least some of it. It was Jimmy Keen who noticed it first, and he apparently told one or two of the others. Geneva would sit the monkey on the bar stool back behind Walt, and he would sit there quiet as could be for the longest time. But once Walt got a good hand, DJ’s eyes would light up, and he’d start doing that blowing thing with his mouth…like he’d just bit down on a hot pepper or something, and the boys would know something was up, and they’d fold their hands right away. “I guess Walt had lost a fair amount of money by the time he figured out what was going on, and he got so mad that he stopped having the games at his house for a while. “Then one night, when Walt and Geneva had just finished eating dinner, DJ brought a deck of cards into the room and put them on the table. They figured he must have rummaged around in one of the cabinets until he found them. Well, Walt apparently still had bad memories of the poker games and told him to beat it, but Geneva thought it was cute—women are like that sometimes—and she put in for Walt to play cards with him, at least for a few minutes. He did, and they ended up playing cards until midnight. “Walt had no intention of playing that long to begin with…because tobacco farmers tend to put in some long hours, and he needed every minute of sleep he could get, but he started getting a little satisfaction out of beating DJ after that monkey had made a fool out of him during the poker games. And it wasn’t too hard to do, either, what with DJ making all those faces and gestures every time he got a good hand. “Then, I guess something clicked inside that monkey’s head, and he realized that he could use those gestures to his benefit. Maybe he realized that every time he made a funny face Walt would fold his hand, and then he won every one of those hands. Two plus two equals four, that sort of a thing. “Anyway, the look on Walt’s face was priceless the first time that monkey bluffed him and won. DJ went to blowing and put both his hands in the air and waved ’em around and grinned real big, and it took all of two seconds for Walt to fold his hand, he himself grinning like he couldn’t believe how stupid monkeys could get. DJ didn’t have a thing in his hand—not even a pair—and Walt’s big grin kinda faded away when he saw that he had been conned by a monkey. Meanwhile, DJ was grinning from ear to ear when he won that hand with nothing more than a jumble of cards. He ended up bluffing Walt several more times that night although he didn’t win every one of the hands. But he won enough of them that Walt got to thinking what it might be like to have that monkey play cards with the boys. “It wasn’t long before the games were back on, with DJ getting a seat at the table. “Well, it didn’t work out well, and it led to the downfall of Don Johnson. He started out losing, and, of course, he was losing Walt and Geneva’s money. The boys thought it was the best thing ever. They could take twice as much of Walt’s money as before, to the tune of about a hundred bucks a month. Walt almost pulled the plug on it, but he kept playing cards with the monkey on the side, and he became convinced that DJ was going to start winning any time. And he did. You should have seen the smile on Walt’s face the night he sent the boys out the door without a penny in their pockets after the monkey picked ’em clean. “Them was the best days DJ ever had, I do believe. There was a real happiness in that house, what with the monkey regularly beating the boys at poker, and all of a sudden a lot more money coming in. Geneva got a new video camera out of it. She had always wanted one, but they never could quite afford it, and I do believe Walt bought a new twelve-gauge pump shotgun, although, he never did kill a thing with it as far as I can remember. But, all good things come to an end, and that’s what happened with DJ’s winning streak. Sherrie liked to booze it up a little bit, so she put together some sort of blender drink with bananas in it one Friday night, and Roy brought it to the poker game. He told Walt and Geneva it was a banana milkshake he had made for the monkey. Walt should have figured it out from the gitgo. Heck, you could smell the rum in it if you tried, but Roy somehow got it past ’em, and Don Johnson drank that whole blender full of banana daiquiris. “Well, at first it only served to help him play better. He seemed to gain confidence with each hand and started staring ’em down real serious as each man contemplated his next move. Real cocky like. “But then that rum really started to kick in, and it wasn’t long before DJ’s winning streak had come to an end. Matter of fact, he lost so much, so fast, that he was the first one out that night, much to the delight of the boys. Walt did not see the humor in it, and he was downright mad when he found out that Sherrie Grace had spiked DJ’s milkshake. Walt and Geneva had the darndest time getting DJ out of bed the next morning, and when they did, he spent the whole day on the couch, holding his head. “Walt swore he was going to get the authorities involved. I don’t think he ever did, but as it turned out, the lost money was the least of his problems. “It seemed Don Johnson began to acquire a taste for alcohol. Walt kept a bottle of whiskey under the sink; he’d had it there so long he’d just about forgotten about it. Geneva used to mix a little of it with honey whenever either one of ’em got sick, one of them old-time recipes. You know the kind. Well, it wasn’t two days after the banana daiquiri incident before Don Johnson had gotten into that whiskey, and they never saw him again after that. Walt and Geneva found the bottle empty on the floor by the sink, with the monkey nowhere to be found. “The sheriff—I believe Floyd Register had the job at the time—came by to see Walt about a week later, asking him whether or not he had a monkey in the house. When Walt asked him why, he said that the town librarian, Gwendolyn Davey had called up the station hysterical as could be, saying that she saw a caveman looking in the bathroom window at her. Said she saw his reflection in the mirror. Walt told the sheriff the whole story, about how he and Geneva had brought him home from the circus by mistake but said they had not seen hide nor hair of that monkey since he got into the whiskey bottle. “There was rumors that Oak Springs had suffered a rash of break ins around that same time, where the only thing stolen were bottles of alcohol, but I never did hear nobody confirm it. Of course, it could have been teenagers just as easy as Don Johnson. You know how teenagers can get. The old man stopped talking at this point, and there was a moment of brief silence before he rose from the crates. A single clap was followed by more as he moved slowly through the crowd, and soon everyone was applauding, including Jennifer. The old man made it as far as the rear of the crowd when he stopped there in his tracks, staring at Jennifer. He smiled at her and then began to move again slowly past her, his eyes never leaving her face. The applause continued until the old man left the store. The group in the back of the store began to slowly break apart, and most of the people gave Jennifer more than a passing glance as they moved away. The woman from the crowd who had smiled at Jennifer was the only one to actually speak to her. The woman handed Jennifer a business card. “I work here at the Oak Springs Chamber of Commerce.” Upon seeing the card, Jennifer glanced back outside. She always kept a few of her own in her purse, for just such occasions, but the purse was outside in the car and retrieving a card before returning to the store would almost certainly draw the wrath of her husband. “I am a schoolteacher,” she offered instead, looking at the woman’s card. It offered all the traditional information business cards do along with a slogan at the bottom. “Who is the old man?” she asked, looking back up. The woman briefly looked down at her feet, thinking about the question. The words hung in the air for a moment or two before Jennifer spoke again. The BMW was in a parking spot on the side of the store. Emerson was leaning up against the passenger side door as she approached. “Want me to drive?” she said, knowing full well that his intent was to confront her, not to pass off the driving responsibilities. Accordingly, he got right to the point. She almost replied but stopped short of doing so, confident that if she said what she truly wanted to say, that if she asked what, exactly, they were late for, he would return to the passenger side of the car and launch into a tirade that they would both be sorry for. She kept her mouth shut instead, and moments later, they pulled out of the parking lot enroute to the on-ramp of the interstate. As the car moved into the right lane of I-10, Jennifer realized she still had Pam’s business card in her hand. Her purse was in the floorboard, and as Emerson looked in the side view mirror for an opportunity to shift into the fast lane, she reached down and picked it up, dropping the card into it as she did. He repositioned himself in the seat, and she got the sense that he was about to speak again. He did but remained silent for a brief moment before doing so. He actually had her all the way up until the end. He was right about the stubbornness; there was no denying it. Jennifer and her sister were famous among family members for their persistent ways. “Headstrong” is what their mother and father called it, and having battled the independent nature of their daughters for more than two decades, Tom and Susan Johnson were perhaps the best judges of all. But he knows what is best for me? Really? WHERE TO BUY IT: Amazon. CONTACT THE AUTHOR: (386) 855-4541. suwanneerivernole@gmail.com.